“We gotta do this more often — get together, I mean,” scarlet speedster Barry Allen told the perpetually sourpussed Oliver Queen at the end of last night’s Legends of Tomorrow. The episode was the concluding chapter of “Invasion!”, an ambitious and unprecedented narrative experiment launched by the CW this week. In it, a single story stretched across the network’s DC Comics–based superhero properties: Supergirl, The Flash, Arrow, and Legends. “I don’t know if the world could take it,” was Oliver’s weary reply to Barry. Well, I’ve got bad news for you, Ollie: There’s gonna be a whole lot more where that came from. So buckle up, buckaroos: The age of the megacrossover is upon us. Smaller-scale crossovers between two shows are a longstanding TV tradition and have brought success to the Berlantiverse in the past. But this was the first time that four prime-time series smashed into one another for a unified story. Theoretically, “Invasion!” could have been a turnoff, given that it required fans of specific series to watch three other hourlong shows featuring characters they might not be familiar with in order to understand what was going on. Seeing how much of a win it ended up being for the whole quartet of programs, it would be shocking if this type of crossover doesn’t become a yearly tradition. That annual-crossover model has already been pioneered and extensively market-tested in another medium: the superhero comics from which these shows sprang. Back in 1984, Marvel Comics’ brilliant and difficult editor-in-chief, Jim Shooter, helmed a company-wide story called Secret Wars that you could only follow in full if you purchased dozens of related comics. It was something of a cynical ploy, but it sold like crazy. The next year brought Secret Wars II and DC’s own stab at the concept, Crisis on Infinite Earths. The year after that brought Mutant Massacre to Marvel and Legends (no relation to the CW show) to DC. In the ensuing 30 years, crossover after crossover has successfully plucked dollars from the pockets of completist geeks. There is constant complaining about “event fatigue,” but if such a condition exists, it’s never been terminal. Of course, superhero crossovers often end up being aesthetically empty cash-grabs. The pitfalls come when creators and overseers fail to coordinate the narrative smoothly, the central conceit is bland, or the individual chapters feel disjointed from the main narrative (e.g. Marvel’s Maximum Security and DC’s Millennium). But when a clever event is conceived smoothly and deployed with enthusiasm, it can be an expansive thrill far greater than the sum of its parts (Marvel’s World War Hulk and DC’s DC One Million leap to mind). “Invasion!” fell somewhere in between, though it thankfully veered toward the pleasant end of the spectrum. The Supergirl episode was a total waste, only featuring 62 seconds’ worth of crossover-related storytelling, but the other three installments of the tale — a chronicle of an averted alien invasion — were delightful. Flash and Legends’ entries were the most crossover-y, expertly juggling a mob of more than two dozen characters in a rhythm that mostly felt effortless. One of the great joys of a superhero crossover is the opportunity for character groupings that aren’t possible in other settings, and viewers got a bevy of those: Supergirl and Heat Wave had profound comedic chemistry, and I honestly didn’t know how much I needed to see Cisco and Felicity hang out with Wild Dog. In a bit of a surprising move, Arrow used the alien invaders as a story prompt: Ollie is hooked up to a machine that makes him dream of a life where he never got on the Queen’s Gambit, thus allowing a cavalcade of guest stars from the show’s past to appear for the 100th-episode extravaganza. However, that dalliance from the core plot can be forgiven, given that we got to see Ollie fire a giant laser gun at a bunch of xenomorphs at the end, which is not a sentence I ever thought I’d write. The climactic CGI battle royale at the end of Legends was a bit chintzy, but hey, it’s the CW. In light of the “Invasion!” success, the creators will likely try to top themselves next time around. 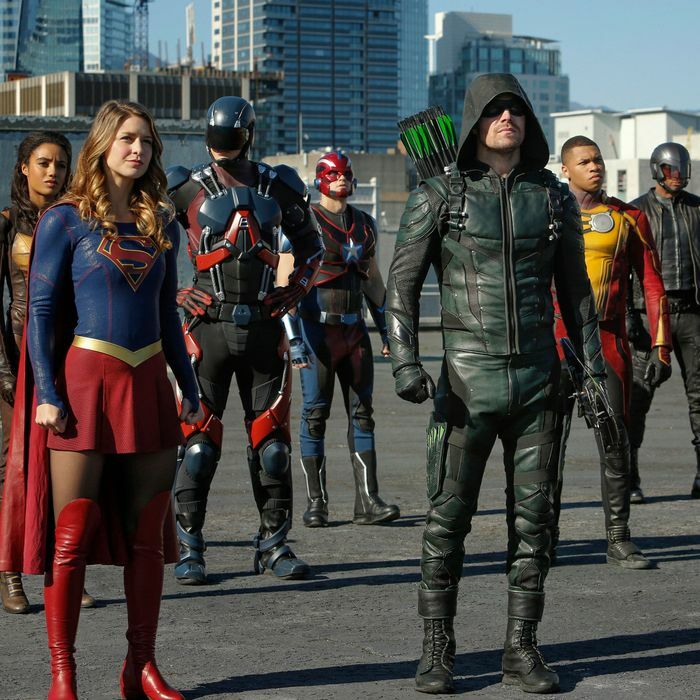 As Arrow and Legends creator Marc Guggenheim put it in an interview with Variety, while discussing the leap from two-show to four-show crossovers: “Every year we pull it off and it’s a small miracle, and then the next year we try to find a way to increase the degree of difficulty.” In other words, the historic first stab at the line-wide TV crossover was a success, and the next one will likely be even more nutso. But as any longtime comics fan can tell you, Berlanti and co. are playing with a dangerous new weapon. Here’s hoping they’ll pick their shots wisely.